Enter virtual reality. 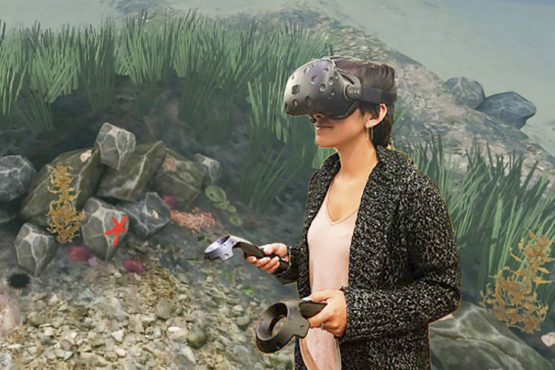 In a new study, published Nov. 30 in Frontiers in Psychology , researchers at Stanford and the University of Oregon discovered that VR can be a powerful tool for improving environmental learning gains and attitudes. The researchers found that experiencing a simulation of ocean acidification’s effects spurred meaningful gains in people’s understanding of the issue. With the advent of affordable consumer-grade gear from companies such as Oculus Rift, Samsung and Microsoft, potential audiences for VR are expanding far beyond Stanford’s multimillion-dollar Virtual Human Interaction Lab . Working with co-author Roy Pea , the David Jacks Professor of Education and director of Stanford’s Human-Sciences and Technologies Advanced Research Institute , Bailenson and his team brought the Stanford Ocean Acidification Experience to more than 270 high school students, college students and adults. By the end of the simulation – which fast-forwards to what the reef will look like at the end of this century – those brilliantly varied and colorful species have disappeared. They are replaced by slimy green algae and the silver Salema Porgy – a fish that will likely thrive in more acidic waters. The simulation is based on the work of Fiorenza Micheli , the David and Lucile Packard Professor of Marine Science at Stanford. Bailenson is also a senior fellow at the Stanford Woods Institute for the Environment . Micheli is also co-director of the Stanford Center for Ocean Solutions and a senior fellow at the Stanford Woods Institute for the Environment . Co-authors also include Rob Laha, a postdoctoral scholar at the time of research.